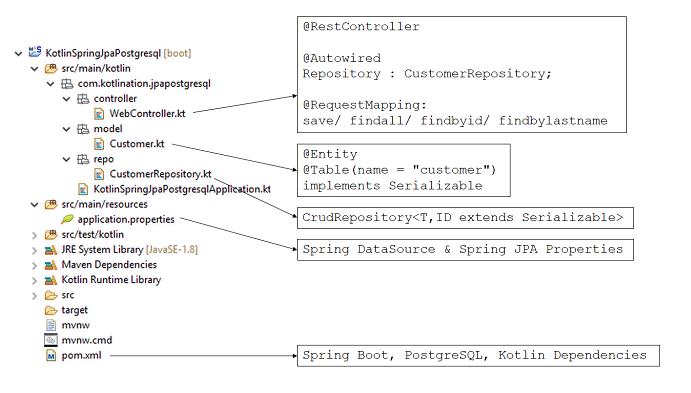 Spring JPA helps us improve our codes and reduce efforts for development and maintenance. It supports us the ways to write interface for repositories and custom finder methods, the implementation will be done automatically by Spring Framework. 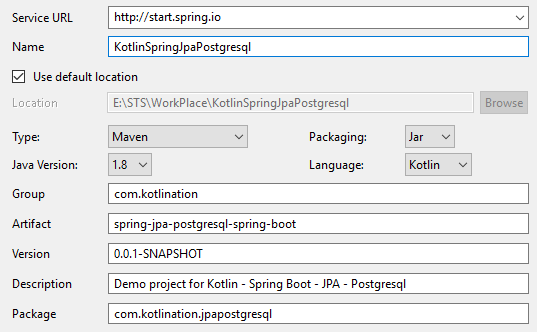 This Kotlin tutorial shows you how to use Spring JPA with PostgreSQL using Spring Boot. – Customer class corresponds to entity and table customer. – CustomerRepository is an interface extends CrudRepository, will be autowired in WebController for implementing repository methods and custom finder methods. – WebController is a REST Controller which has request mapping methods for RESTful requests such as: save, findall, findbyid, findbylastname. Click Next and Finish, then our project will be created successfully. – Annotation @Entity indicates that Customer is an Entity. Table customer and column: id, first_name, last_name will be created automatically. – @ID specifies the primary key and @GeneratedValue indicates generation strategy for value of primary key. – Constructor method will be used by Spring JPA. Under package controller, create a controller that receives requests from client, using repository to update/get data and return results.